CONTEXT: The management of breast cancer in older patients is challenging due to factors such as comorbidities, limited mobility, functional dependence, cognitive functions, and socioeconomic aspects. Data about the outcomes in elderly patients with breast cancer in our country are sparse. AIMS: The aim of this study was to evaluate and compare the clinical and pathological variables, treatment, and survival outcomes of elderly women (those of 70 years and above) with women under 50 years and those between the ages of 50 and 69 years treated at our center. SUBJECTS AND METHODS: Prospectively collected clinical and pathological data from January 2007 to December 2014 were recorded and entered into OncoCollect™ software. Statistical analysis was done using Microsoft R Open software. Survival analysis was estimated using Kaplan–Meier curves. RESULTS: A total of 1226 Stage I–III breast cancer patients were treated between January 2007 and December 2014. Of these, 11.3% (139) were aged 70 years and above. Invasive ductal carcinoma was predominant and majority had Stage II disease and grade 1 tumors. Receptor positivity was observed in 79% of elderly patients and 9% had triple-negative disease. Primary hormone therapy was given to 7% of the patients and chemotherapy was administered to 12%. The 5-year overall survival for patients 70 years and older is 85%. CONCLUSIONS: Elderly patients are more likely to have an indolent course with low grade and estrogen receptor-positive tumors. For healthy older women, treatment according to standard guidelines including surgery, chemotherapy, and radiation should be followed. However, for those who are unfit and cannot tolerate surgery, primary endocrine therapy is a suitable option. Breast cancer is the most common cancer affecting women worldwide. The incidence of breast cancer in India is increasing, accounting for 140,000 new cases annually, along with an increase in the elderly population. As the age increases, the risk of breast cancer significantly increases. Numerous studies have shown that over 30% of women diagnosed with breast cancer are above the age of 70 years., The management of breast cancer in the elderly tends to be more challenging as several factors such as significant comorbidities, limited physical mobility, functional dependence, emotional and cognitive functions, and socioeconomic factors impede treatment in this group. In addition, treatment-related guidelines specific to this age group are lacking. There is a paucity of data with regard to treatment-related toxicities, quality of life, and outcomes. Limited data is available on the treatment patterns of the elderly women (70 years and above) in India. The aim of this study was to evaluate and compare the clinical and pathological variables, treatment, and survival outcomes of elderly women with those aged under 50 and those between the ages of 50 and 69 years treated at our center. Survival analysis was done using Kaplan–Meier curves. Overall survival (OS) is defined as time from date of diagnosis to date of death. Disease-free survival (DFS) is defined as time to any recurrence (local or distant) or death due to any cause, whichever occurred first. Of the 1226 patients analyzed, 11.3% (139) were 70 years and above, 48.6% (596) were between the age of 50 and 69 years, and the remaining 39.9% (489) were below the age of 50 years [Table 1]. Invasive ductal carcinoma was predominant in 113 (81%) patients in the elderly age group. Sixty percent of the patients (83) had Stage II disease in the elderly group, which was comparable to those under 70 years. Grade 1 tumors were seen in more number of patients in the over 70 (22%) age group when compared to patients younger than 50 years (9%) and 50–69 years (13%). Elderly patients were estrogen receptor (ER) or PR positive or both in over 79%, as against 70% in 50–69 years age group and 60% in the less than 50 years age group. Triple-negative breast cancers (TNBC) were less common in elderly patients (9%) compared to 14% in the 50–69-year-old age group and 26% in the younger than 50 years age group. Her2 positivity (with either ER/PR positive or negative) was lower in the elderly patients (12%) when compared to 23% in the 50–69-year and less than 50-year-old age group. Majority of the elderly patients treated at our center (93%) underwent surgery. In the elderly group, BCS was done in 12% as against 18% and 25% in the 50–69 and under 50-year-old age group, respectively. There was no difference in the axillary management in the elderly and in the 50–69 and less than 49-year-old age group. SLNB was done in 29% and axillary clearance in 60% in the elderly. In the 50–69-year and less than 49-year age group, 32% and 27% had SLNB, respectively. TNBC was noted in 13 (9%) patients and 40% of patients were node positive in the elderly group. Only 16 patients of the 139 elderly patients received chemotherapy, out of which 6 received neo-adjuvant chemotherapy. Two patients among 44 with Stage IIA disease, 7 of 39 patients with Stage IIB disease, and 7 of 22 patients with Stage III disease received chemotherapy. Patients' choice and comorbidities including diabetes mellitus, hypertension, coronary artery disease, stroke, and COPD were factors limiting the use of chemotherapy in the elderly. Adjuvant hormone therapy was the preferred option as adjuvant systemic therapy because more than 80% of elderly patients were ER positive. All ER-positive elderly patients received hormone therapy. Letrozole was more frequently used than tamoxifen. Letrozole was discontinued in favor of tamoxifen in 15% of patients with joint pains and stiffness. Radiotherapy was given to only 19% (26) of patients in the elderly group, in comparison to 49% and 57% in the 50–69-year and less than 50-year-old age groups, respectively. Among the 17 elderly patients who underwent BCS, only 7 underwent RT following surgery. Radiotherapy to the breast after BCS was omitted in 10 patients who had small, grade one, node negative, and strong ER-positive tumors. In elderly patients, the 48-month survival was 86% as against 92% in both the less than 50-year and 50–69-year-old age groups (P value 0.047). 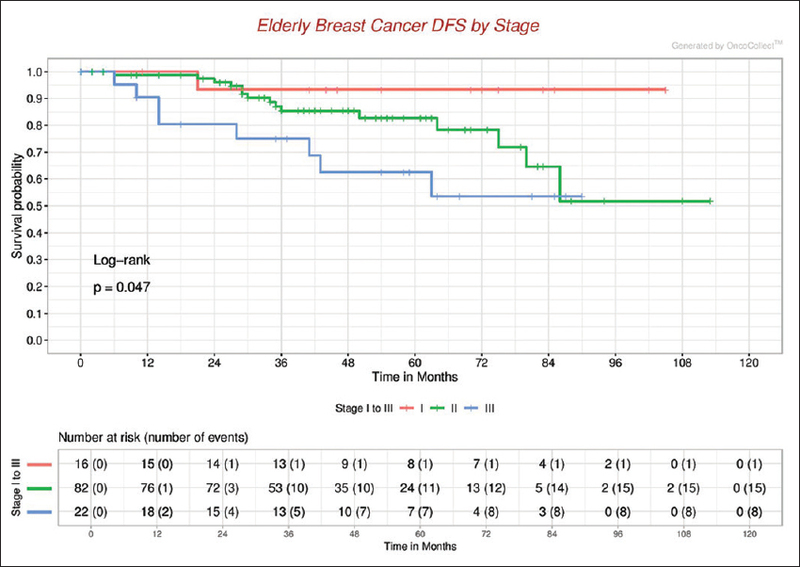 Among the elderly patients, patients belonging to Stage I had a 100% survival at 48 months, Stage II had an 88% and Stage III 65% survival (P = 0.06) [Figure 1], [Figure 2], [Figure 3], [Figure 4]. The United Nations population division project states that between 2010 and 2050, the elderly population over 65 years in India is set to increase from 5% to 14%, whereas the share of the oldest age group (80 years and above) will triple from 1% to 3%. As a consequence of the demographic change, the incidence of all cancers is set to increase. Breast cancer risk increases with age and a sharp rise in the proportion of elderly women diagnosed with breast cancer is expected in India. There is little data that outlines the management of breast cancer in the elderly in India. Elderly women diagnosed with breast cancer often receive less aggressive treatment worldwide. It is no different in India. Fear of treatment-related toxicity, increasing dependence on other family members for medical attention and financial constraints in addition to poor performance status, and significant comorbidities are barriers for elderly women to get optimal breast cancer treatment. Mastectomy is preferred over BCS in most elderly women. In general, breast conservation (20%) in our practice is significantly lower than in the West. Breast conservation rates in the elderly in our practice were lower, mostly to avoid radiotherapy. Financial considerations along with restricted physical mobility make mastectomy a preferred option rather than breast conservation. Primary hormone therapy alone was administered in 7% of patients. Advanced disease, significant comorbidities, and refusal of surgery were reasons for adopting primary hormone therapy in this age group. There were no deaths in patients who had only hormone therapy. The biology of breast cancer in elderly patients appears to have a more indolent course., More elderly patients are likely to be ER-positive, with lower grade tumors. Primary hormone therapy without surgery is an attractive option, particularly in those who are perceived to be not fit for surgery or in those who decline surgery. However, a Cochrane systematic review of six randomized controlled trials has shown that surgery resulted in better DFS than endocrine therapy with tamoxifen alone but there were no differences in the OS., Primary endocrine therapy should only be offered to women with ER-positive tumors who are unfit for surgery, at increased risk for surgical or anesthetic complications or for those who refuse surgery. The CRC, Greta, and the Nottingham 2 studies have compared surgery and tamoxifen with tamoxifen alone and results indicated that primary endocrine treatment with tamoxifen was comparable to the surgery plus tamoxifen arm., The Netherlands cancer registry analysis of over 26,000 women aged 75 years over-evaluated the effects of omitting surgery on survival. Their OS was not different in those who did not have surgery (HR 1.00, 95% CI 0.99–1.00). Guidelines regarding chemotherapy for elderly are not clearly available and they are not well represented in clinical trials. Even when elderly patients are included in clinical trials, those with significant renal, hepatic, and cardiac impairment are often excluded from the study. In addition to age-related organ function decline, treatment-related toxicities, quality-of-life issues, and comorbidities along with projected life expectancy are major factors that influence the decision of administering chemotherapy in elderly patients. In our group, only 16% received chemotherapy despite 40% being node positive in the elderly age group. Only 35% of Her2-positive patients received trastuzumab. All ER-positive patients received hormone therapy. The less aggressive use of adjuvant chemotherapy in the elderly age group in our patients is probably the contributory factor for the lower OS at 48 months in the elderly age group [86% as against 92% in both the less than 50 years and 50–69-year age groups (P value 0.047)]. Functional assessment of an older person is essential to guide treatment. The most common method of measurement of functional status in general use is the Karnofsky performance status and the Eastern Cooperative Oncology group scale. A comprehensive geriatric assessment specific to the elderly is used by geriatricians to identify the frail older patients and treatment options to the medically fit versus frail can be used. However, it is lengthy and time-consuming involving 44–84 questions and not widely practiced. A simpler screening tool that identifies malnutrition, depression, cognition, comorbidity, and assessment of autonomy will help. A study from the SEER registry has shown that adjuvant chemotherapy in receptor-negative elder women has a 15% mortality reduction on multivariate analysis and this benefit is more pronounced in patients with node-positive disease, high grade, and larger tumors. Adjuvant chemotherapy with anthracyclines and/or taxane-containing regime is preferred in medically fit elderly women., In patients with pre-existent heart failure or significant comorbidities like long-standing diabetes or hypertension that can contribute to heart failure, docetaxel with cyclophosphamide may be considered. For women who are not suitable for anthracyclines or taxanes, cyclophosphamide, methotrexate, and 5-fluorouracil (with oral cyclophosphamide) are reasonable options. We have not used any risk assessment tool in our practice. A more systematic assessment of risk from toxicities due to chemotherapy is possible with scores like the cancer and aging research group and the chemotherapy risk assessment scale for high age patients, which, can help to decide adjuvant chemotherapy. Adjuvant radiotherapy may be selectively avoided in elderly women after breast conservation in small, low-grade, strong ER-positive and node-negative tumors with favorable histology like mucinous or tubular cancers.,, In others, whole breast or chest wall radiotherapy is based on conventional criteria like tumor size, nodal status, and extra-nodal infiltration. In our study, among the 17 elderly patients who underwent BCS, only 7 underwent RT following surgery. Radiotherapy to the breast after BCS was omitted in 10 patients who had small, grade one, node negative, and strong ER-positive tumors. 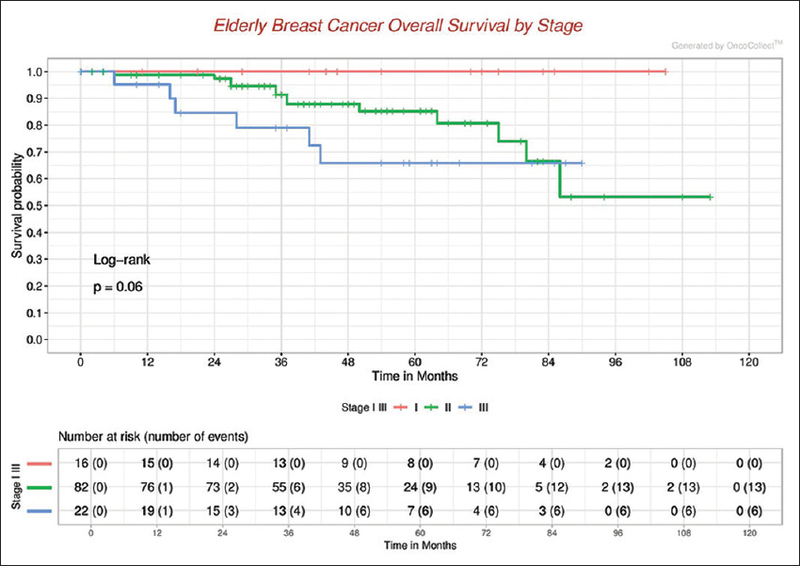 There were no local recurrences in the elderly patients in whom radiotherapy to the breast after BCS was omitted. Elderly patients are more likely to have an indolent course with low-grade and ER-positive tumors. More aggressive use of adjuvant chemotherapy with appropriate risk assessment in the elderly could improve OS. Appropriate assessment is necessary for this age group to guide optimal therapy. For healthy older women, treatment according to standard guidelines including surgery, chemotherapy, hormone therapy, and radiotherapy should be followed. For frail elderly patients, surgery should be performed followed by endocrine therapy where applicable. Primary endocrine therapy should be reserved for candidates who are unfit for or refuse surgery. The authors would like to thank Ramesh Nimmagadda Cancer Foundation for their technical support and providing OncoCollect software for data collection and analysis. Rao YN, Gupta S, Agarwal SP. Fifty years of cancer control in India. National Cancer Control Programme: Current Status & Strategies. Director General of Health Services, MOHFW, Government of India; 2002. p. 41-7. National Sample Survey Office, Elderly in India. Ministry of Statisitcs Program Implementation; 2016. p. 1-95. Sanguinetti A, Polistena A, Lucchini R, Monacelli M, Avenia S, Conti C, et al. Breast cancer in older women: What factors affect the treatment? Int J Surg 2014;12:S177-80. Santangelo G, Pellino G, De Falco N, Colella G, D'Amato S, Maglione MG, et al. Prevalence, diagnosis and management of ectopic thyroid glands. Int J Surg 2016;28:S1-6. ONU. World population, ageing. Suggested citation: United Nations, Department of Economic and Social Affairs, Population Division (2015). World Population Ageing. vol. United Nat, no. (ST/ESA/SER.A/390):164:2015. Sarkar A, Shahi UP. Assessment of cancer care in Indian elderly cancer patients: A single center study. South Asian J Cancer 2013;2:202. Cicero MT. Cancer in the elderly–Get ready for the 'epidemic'. Medicine Updat 2005; p.828. Pierga JY, Girre V, Laurence V, Asselain B, Dieras V, Jouve M, et al. 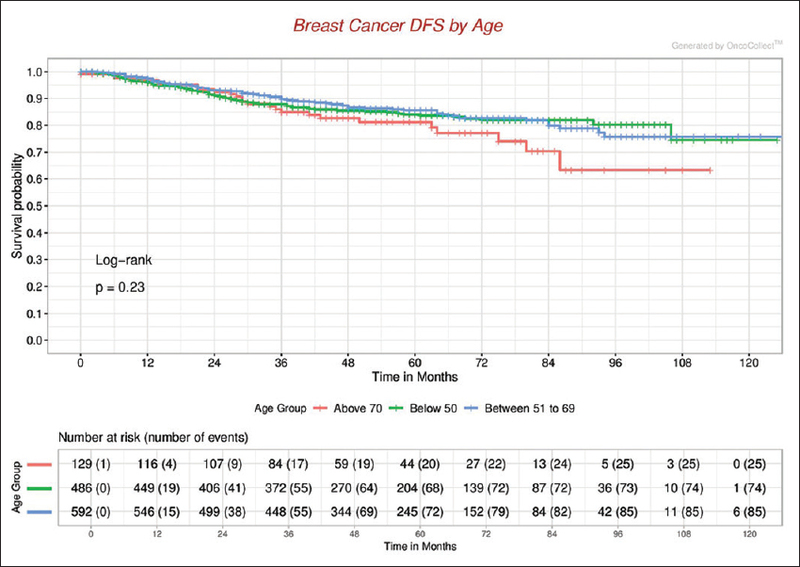 Characteristics and outcome of 1755 operable breast cancers in women over 70 years of age. Breast 2004;13:369-75. Hind D, Wyld L, Reed MW. Surgery, with or without tamoxifen, vs tamoxifen alone for older women with operable breast cancer: Cochrane review. Br J Cancer 2007;96:1025. Hind D, Wyld L, Beverley CB, Reed MW. 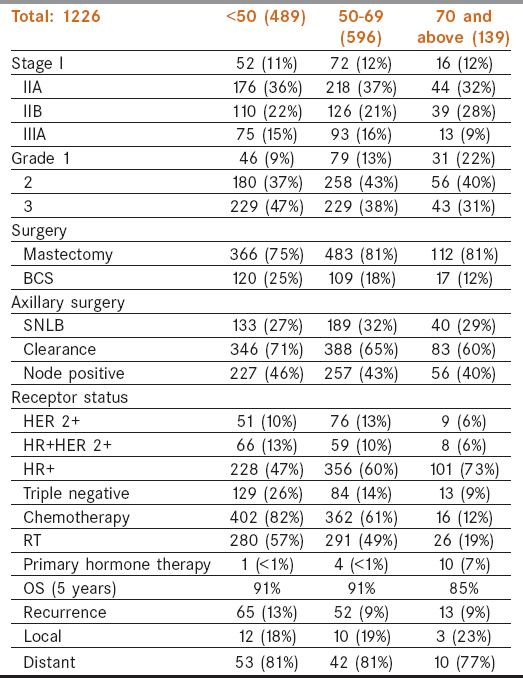 Surgery versus primary endocrine therapy for operable primary breast cancer in elderly women (70 years plus). Cochrane Database Syst Rev 2006;1:CD004272. Mustacchi G, Ceccherini R, Milani S, Pluchinotta A, De Matteis A, Maiorino L, et al. Tamoxifen alone versus adjuvant tamoxifen for operable breast cancer of the elderly: Long-term results of the phase III randomized controlled multicenter GRETA trial. Ann Oncol 2003;14:414-20. Johnston SJ, Kenny FS, Syed BM, Robertson JF, Pinder SE, Winterbottom L, et al. A randomised trial of primary tamoxifen versus mastectomy plus adjuvant tamoxifen in fit elderly women with invasive breast carcinoma of high oestrogen receptor content: Long-term results at 20 years of follow-up. Ann Oncol 2012;23:2296-300.
de Glas NA, Jonker JM, Bastiaannet E, de Craen AJ, van de Velde CJ, Siesling S, et al. Impact of omission of surgery on survival of older patients with breast cancer. Br J Surg 2014;101:1397-404. Conill C, Verger E, Salamero M. Performance status assessment in cancer patients. Cancer 1990;65:1864-6. Puts MT, Hardt J, Monette J, Girre V, Springall E, Alibhai SM. Use of geriatric assessment for older adults in the oncology setting: A systematic review. J Natl Cancer Inst 2012;104:1134-64. Early Breast Cancer Trialists' Collaborative Group. Effects of chemotherapy and hormonal therapy for early breast cancer on recurrence and 15-year survival: An overview of the randomised trials. Lancet 2005;365:1687-717. Early Breast Cancer Trialists' Collaborative Group. Comparisons between different polychemotherapy regimens for early breast cancer: Meta-analyses of long-term outcome among 100 000 women in 123 randomised trials. Lancet 2012;379:432-44. Jones S, Holmes FA, O'Shaughnessy J, Blum JL, Vukelja SJ, McIntyre KJ, et al. Docetaxel with cyclophosphamide is associated with an overall survival benefit compared with doxorubicin and cyclophosphamide: 7-year follow-up of US Oncology Research Trial 9735. J Clin Oncol 2009;27:1177-83. Ung O, Langlands AO, Barraclough B, Boyages J. Combined chemotherapy and radiotherapy for patients with breast cancer and extensive nodal involvement. J Clin Oncol 1995;13:435-43. Hurria A, Togawa K, Mohile SG, Owusu C, Klepin HD, Gross CP, et al. Predicting chemotherapy toxicity in older adults with cancer: A prospective multicenter study. J Clin Oncol 2011;29:3457. Extermann M, Boler I, Reich RR, Lyman GH, Brown RH, DeFelice J, et al. Predicting the risk of chemotherapy toxicity in older patients: The chemotherapy risk assessment scale for high age patients (CRASH) score. Cancer 2012;118:3377-86. Veronesi U, Marubini E, Mariani L, Galimberti V, Luini A, Veronesi P, et al. Radiotherapy after breast-conserving surgery in small breast carcinoma: Long-term results of a randomized trial. Ann Oncol 2001;12:997-1003. Smith BD, Gross CP, Smith GL, Galusha DH, Bekelman JE, Haffty BG. 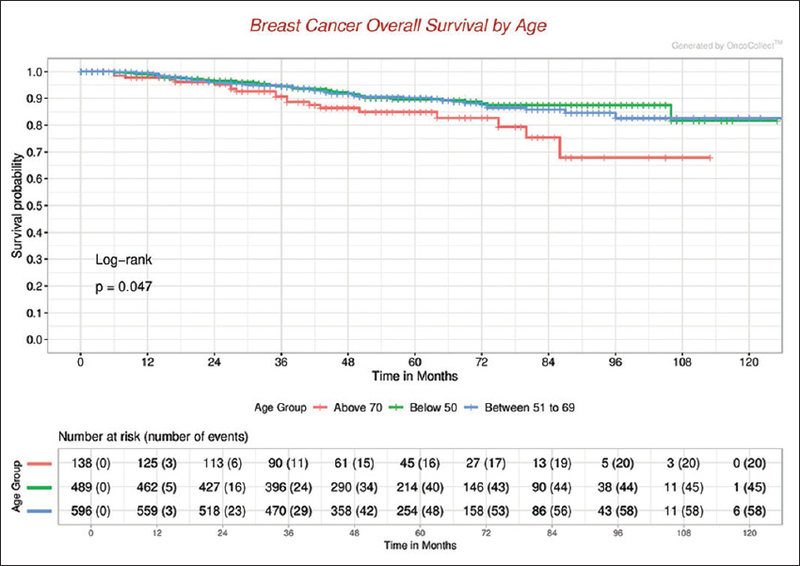 Effectiveness of radiation therapy for older women with early breast cancer. J Natl Cancer Inst 2006;98:681-90. Kunkler IH, Williams LJ, Jack WJ, Cameron DA, Dixon JM. Breast-conserving surgery with or without irradiation in women aged 65 years or older with early breast cancer (PRIME II): A randomised controlled trial. Lancet Oncol 2015;16:266-73. Deutsch M. Radiotherapy after lumpectomy for breast cancer in very old women. Am J Clin Oncol 2002;25:48-9.